Below you will find an overview of SMG's core research areas. The Department of Strategic Management and Globalization has five core research areas. Our research is carried out in the intersecting fields of strategic and international management. The research is based on the unique mix of ideas from organizational economics and strategic theory, which the Department’s group of researchers have developed within the last decade. This stream seeks to identify the predictors of the sourcing, sharing, transfer, integration, and creation of knowledge within firms and between firms (and other actors). It does so in terms of theorizing and empirically analyzing 1) the individual level foundations of these processes (in terms of the motivation, opportunity and ability to, e.g., share knowledge) and 2) how organizational design and HRM practices can influence knowledge processes to the benefit of the firm. Recently, this stream has also embraced the role of space (e.g., how office space is structured) as a predictor of knowledge processes. Research in this stream has been partly financed by a major grant by the Danish Social Science Research Council. Empirically, it involves collaboration with major Danish companies like Cowi, MAN Diesel, NNIT, Rambøll and others, e.g., implementing survey instruments in these firms. Reinholt M., T. Pedersen and N. J Foss. 2011. Why a Central Network Position Isn’t Enough: the Moderating Roles of Motivation and Ability for Knowledge Sharing in Employee Networks . Academy of Management Journal (forthcoming). Minbaeva D., K. Mäkelä and L. Rabbiosi. HRM system outcomes and knowledge sharing: The mediating effect of individual motivation and behaviors. Human Resource Management (forthcoming). Foss, N.J., K. Laursen and T. Pedersen. 2011. Linking Customer Interaction and Innovation: The Mediating Role of New Organizational Practices . Organization Science, 22: 980-999. Lindenberg, S. and N.J. Foss. 2011. Managing Motivation for Joint Production: The Role of Goal Framing and Governance Mechanisms . Academy of Management Review 36: 500-525. Foss, N.J., D. Minbaeva, M. Reinholt, and T. Pedersen. 2009. Encouraging Knowledge Sharing Among Employees: How Job Design Matters . Human Resource Management 48: 871-893. Nielsen, B.B. and S. Michailova. 2007. Knowledge Management Systems in Multinational Corporations: Typology and Transitions, Long Range Planning, 40(3): 314-340.
combination of long cycled forward looking risk considerations and short cycled experiential risk responses. It thus provides a promising new analytical approach. 2. Strategic alliances. Strategic alliances constitute a fundamental strategic choice that is often associated with a tradeoff between risk and control of investments. Hence, a particular focus within this research stream focuses on how firms use various governance mechanisms to increase the functionality and returns of their alliance strategies. strategic decision-making, this research stream assesses how decisions are conditioned by bounded rationality of individuals, utilizing advanced, multilevel methodology. Nielsen, B.B. & Nielsen, S. 2011. The Role of Top Management Team International Orientation in Strategic Decision-Making: The Choice of Foreign Entry Mode , Journal of World Business, 46(2): 185-193. Andersen T. J. & Schrøder, P.W. 2010. Strategic Risk Management Practice: How to Deal Effectively with Major Corporate Exposures , Cambridge University Press, Cambridge, UK. Nielsen, B.B & Nielsen, S. 2009. Learning and Innovation in International Strategic Alliances: An Empirical Test of the Role of Trust and Tacitness , Journal of Management Studies, 46(6): 1031-1056. Andersen TJ, Nielsen B.B. 2009. Adaptive strategy-making: The effects of emergent and intended strategy modes , European Management Review, 6(1). Andersen T.J, Denrell J, Bettis R.A. 2007. Strategic responsiveness and Bowman’s risk-return paradox , Strategic Management Journal, 28, 2007. Linder, S. 2011. Micro-foundations of Strategic Entrepreneurship: Essays on Autonomous Strategic Action. PhD Thesis. Department of Strategic Management and Globalization, CBS. the 3,000 largest Danish firms, undertaken in 2009 in cooperation with Statistics Denmark, as well as the Danish labor market data base, IDA. Work under this project is supported by a grant from the Danish Social Science Research Council. 2. Management innovation: This project examines the incidence, drivers, consequences, and organizational aspects of management innovations in Danish firms. SMG work on management innovation includes a series of case studies of management innovations in Danish firms (Foss, Pedersen, Pyndt and Schultz, 2011) and studies based on a survey of management innovation in Danish firms (Harder, 2011). Foss, N. J. and P. G. Klein. 2012. Organizing Entrepreneurial Judgment: A New Approach to the Firm . Cambridge: Cambridge University Press. Foss, N. J., T. Pedersen, J. Pyndt and M. Schultz. 2011. Innovating Organization and Management . Cambridge: Cambridge University Press. Harder, M. 2011. Internal Antecedents of Management Innovation . PhD Dissertation, Copenhagen Business School. Foss, K. and N.J. Foss. 2008. Understanding Opportunity Discovery and Sustainable Advantage: The Role of Transaction Costs and Property Rights . Strategic Entrepreneurship Journal 2: 191-207. 1. Dynamics of globalization: The location factor has long been neglected in International Management studies, traditionally relegated to an exogenous role and ascribed a somewhat trivial impact. One major source of this neglect is our conceptualization of firms’ location-specific advantages as completely distinct from firm-specific advantages—i.e., a factor that only explains the choice of location for different activities but not the variation in firm-specific advantages. Hence, the purpose of this project is to make location-specific factors more endogenous to firm competitiveness. 2. Hidden costs of offshoring: The “fine-slicing” and geographical dispersion of value-chain activities that are infusing more complexity in the organization are often ignored in offshoring decisions. The complexity will typically manifest itself in hidden costs that materialize when implementing the decision. The project aims at identifying organizational mechanism to mitigate the hidden costs of offshoring like standardization, modularization, etc. Jensen P. Ø. and T. Pedersen. 2012. Offshoring and International Competitiveness: Antecedents of Offshoring Advanced Tasks . Journal of the Academy of Marketing Science. Asmussen, C. G., T. Pedersen, T. Devinney and L. Tihanyi. 2011. Advances in International Management, 24: Dynamics of Globalization: Location-Specific Advantages or Liabilities of Foreignness? Emerald. Jensen, P.Ø. and B. Petersen. 2011. Global Sourcing of Advanced Services - A Strategic Management Analysis. Strategic Management Society Conference Paper. Larsen, M. M., S. Manning and T. Pedersen. 2011. Uncovering the Hidden Costs of Offshoring: The Interplay of Complexity, Organizational Design and Experience . Conference Paper (finalist for Best Paper Award at the Academy of Management Annual Meeting, San Antonio, Texas, 12-16 August, 2011). Jensen P. Ø. and T. Pedersen. T. 2011. The Globalization of High-Value Activities: Why do Firms Offshore Advanced Tasks? Journal of Management Studies, 48: 352-372. Contractor F., V. Kumar, S. Kundu and T. Pedersen. 2010. Reconceptualizing the Firm in a World of Outsourcing and Offshoring: The Organizational and Geographical Relocation of High-Value Company Functions (with) . Journal of Management Studies, 47: 1417-1433. Multinational Corporations (MNCs) are extremely complex organizations and there is ongoing interest in the question how such organizations can be best structured and managed in order to profit from the exposure to multiple, diverse environments. SMG research on the MNC starts from the modern view of the MNC as a network-like structure consisting of a web of semi-autonomous subunits. On the subunit-level, this stream devotes much attention to organizational learning, for example through the exposure to and collaboration with local business networks and institutional contexts, as well as to lateral and vertical knowledge flows. It also investigates drivers of subsidiary behavior and subsidiary evolution. Nell, P. C., Ambos, B., Schlegelmilch, B.B. The MNC as an externally embedded organization: An investigation of embeddedness overlap in local subsidiary networks . Journal of World Business (forthcoming). Hotho, J.J., Becker-Ritterspach, F.A.A., and Saka-Helmhout, A. Enriching Absorptive Capacity through Social Interaction , British Journal of Management (forthcoming). Rabbiosi L., 2011. Subsidiary Roles and Reverse Knowledge Transfer: An Investigation of the Effects of Coordination Mechanism . Journal of International Management, 17: 97-113. Andersson, U. & Holm, U., eds. 2010. Managing the Contemporary Multinational . Edward Elgar. Asmussen, C.G., Dhanaraj, C. and Pedersen, T. 2009. Host-country environment and subsidiary competence: Extending the diamond network model . Journal of International Business Studies, 40: 42-58. Filippaios, F., Papanastassiou, M., Pearce, R. and Rama, R. 2009. New forms of organisation among the world’s 100 largest food and beverages multinationals . Research Policy, 38: 1032-1043. Petersen, B., T. Pedersen and M. Lyle. 2008. Closing Knowledge Gaps in Foreign Markets . Journal of International Business Studies, 39: 1097-1113. Michailova S. and Minbaeva D. Organizational Values and Knowledge Sharing in Multinational Corporations : The Danisco Case. International Business Review, Vol. 21, Nr. 1, 2012, s. 59-70. Foss, N. J. 2011. Human Capital and Transaction Cost Economics. In The Oxford Handbook of Human Capital. red. A. Burton-Jones and J. C. Spender. Oxford : Oxford University Press, 2011. s. 165-185. Holdt Christensen, P. 2011. Autonomy as a Stressor in Knowledge Work. In Global Knowledge Work: Diversity and Relational Perspectives. red. K. Nicolopoulou, M. Karatas-Özkan, A. Tatli and J. Taylor. Cheltenham : Edward Elgar Publishing, Incorporated, 2011. s. 243-254. Foss, N. J. and S. Lindenberg. 2011. Managing Joint Production Motivation: The Role of Goal Framing and Governance Mechanisms. Academy of Management Review, Vol. 36, Nr. 3, 06.2011, s. 500-525. Foss, N. J. and T. Felin. 2011. The Endogenous Origins of Experience, Routines and Organizational Capabilities: The Poverty of Stimulus. Journal of Institutional Economics, Vol. 7, Nr. 2, 2011, s. 231-256. Foss, N. J. and P. H. Christensen. 2011. Utfordringer ved motivasjon og ledelse av kunnskaparbeidere. Magma, Vol. 0311, 2011, s. 41-48. Gooderham, P., D. Minbaeva and T. Pedersen. 2011. Governance Mechanisms for the Promotion of Social Capital for Knowledge Transfer in Multinational Corporations. Journal of Management Studies, Vol. 48, Nr. 1, 2011, s. 123-150. Rabbiosi, L. and T. Reichstein. 2011. Organizing for External Knowledge Sourcing. European Management Review, Vol. 8, Nr. 3, 2011, s. 111-116. Rabbiosi, L. 2011. Subsidiary Roles and Reverse Knowledge Transfer: An Investigation of the Effects of Coordination Mechanisms. Journal of International Management, Vol. 17, Nr. 2, 2011, s. 97-113. Reinholt, M., T. Pedersen and N. J. Foss. 2011. Why a Central Network Position Isn't Enough: The Role of Motivation and Ability for Knowledge Sharing in Employee Networks. Academy of Management Journal, 02.2011. Foss, N. J. 2011. Why Micro-foundations for Resource-Based Theory Are Needed and What They May Look Like. Journal of Management, Vol. 37, Nr. 5, 2011, s. 1413-1428. Knudsen, L. G. and B. B. Nielsen. 2010. Collaborative Capability in R&D Alliances: Exploring the Link Between Organisational- and Individual-Level Factors. International Journal of Knowledge Management Studies, Vol. 4, Nr. 2, 2010, s. 152-175. Kunz, J. and S. Linder. 2010. The Impact of Management Control Systems on Knowledge Processes: A Behavioural Perspective. International Journal of Strategic Change Management, Vol. 2, Nr. 1, 2010, s. 54-72. Minbaeva, D. and T. Pedersen. 2010. Governing Individual Knowledge-Sharing Behaviour. International Journal of Strategic Change Management, Vol. 2, Nr. 2/3, 2010, s. 200-222. Nielsen, B. B. 2010. The Role of Knowledge Governance in Strategic Alliances. International Journal of Strategic Change Management, Vol. 2, Nr. 2/3, 2010, s. 102-127. Foss, K. and N. J. Foss. 2010. Resources and transaction costs: How property rights economics furthers the resource-based view. In Knowledge, Economic Organization and Property Rights: Selected papers. red. N. J. Foss. Cheltenham: Edward Elgar Publishing, Incorporated, 2009. s. 284-296. Foss, N. J. 2010. The use of knowledge in firms. In Knowledge, Economy Organization and Property Rights: Selected papers, red. N. J. Foss. Cheltenham: Edward Elgar Publishing, Incorporated, 2009. s. 80-108. Foss, K. 2010. The use of managerial authority in the knowledge economy. In The Modern Firm, Corporate Governance and Investment, red. P. Bjuggren and D. C. Mueller. Cheltenham: Edward Elgar Publishing, Incorporated, 2009. s. 82-103. Foss, K., N. J. Foss and X. H. Vasquez. 2010. Tying the manager's hands: Constraining opportunistic managerial intervention. In Knowledge, Economic Organization and Property Rights: Selected papers, red. N. J. Foss. Cheltenham: Edward Elgar Publishing, Incorporated, 2009. s. 209-230. Holdt Christensen, P. 2010. Motivation af videnarbejdere. In Knowledge Management. Børsen Forum A/S, 2009. s. 1-14 (Børsens Ledelseshåndbøger). Knudsen, L. G. and B. B. Nielsen. 2010. Antecedents of Procedural Governance in Knowledge-Sharing Alliances. In Knowledge Management and Organizational Learning, red. W. R. King. Springer, 2009. s. 145-161 (Annals of Information Systems; 4). Mahnke, V. , T. Pedersen, and M. Venzin. 2010. Does Knowledge Sharing Pay? : A Multinational Subsidiary Perspective on Knowledge Outflows. In Advances in International Management, red. J. L. C. Cheng, E. Maitland and S. Nicolas. Vol. 22 Emerald Group Publishing Limited, 2009. s. 123-149 (Advances in International Management). Michailova, S. and N. J. Foss. 2010. Knowledge Governance : Themes and Questions. In Knowledge Governance: Processes and perspectives, red. N. J. Foss and S. Michailova. Oxford: Oxford University Press, 2009. s. 1-24. Foss, N. J. and E. Roemer. 2010. Real Options, Resources and Transaction Costs: Advancing the Strategic Theory of the Firm. International Journal of Strategic Change Management, Vol. 2, Nr. 1, 2010, s. 73-92. Grittia, P. and N. J. Foss. 2010. Customer Satisfaction and Competencies: An Econometric Study of an Italian Bank. Applied Economics Letters, Vol. 17, Nr. 18, 2010, s. 1811-1817. Volberda, H. W., N. J. Foss and M. A. Lyles. 2010. Absorbing the Concept of Absorptive Capacity: How to Realize Its Potential in the Organization Field. Organization Science, Vol. 21, Nr. 4, 2010, s. 931-951. Holdt Christensen, P. 2010. Mere videndeling. København: Hans Reitzel, 2010. 208 s.
Foss, N. J. (Editor). 2009. Knowledge, Economic Organization and Property Rights: Selected papers. Cheltenham: Edward Elgar Publishing, Incorporated, 2009. 347 s.
Foss, N. J. (Editor) and S. Michailova (Editor). 2009. Knowledge governance: Processes and perspectives. Oxford : Oxford University Press, 2009. 296 s.
Holdt Christensen, P. 2009. Videnledelse. In Ledelse og organisation : Forandringer og udfordringer, red. M. Elting and S. Hammer. Frederiksberg: Samfundslitteratur, 2009. s. 93-112. Foss, N. J. 2009. Alternative Research Strategies in the Knowledge Movement: From Macro Bias to Micro-Foundations and Multi-Level Explanation. European Management Review, Nr. 6, 2009, s. 16-28. Foss, N. J., D. Minbaeva, T. Pedersen and M. Reinholt. 2009. Encouraging Knowledge Sharing Among Employees: How Job Design Matters. Human Resource Management, Vol. 48, Nr. 6, 2009, s. 871 - 893. Foss, N. J. and M. Lorenzen . 2009. Towards an Understanding of Cognitive Coordination : Theoretical Developments and Empirical Illustrations. Organization Studies, Vol. 30, Nr. 11, 12.11.2009, s. 1-26. Minbaeva, D., N. J. Foss and S. Snell. 2009. Guest Editors´ Introduction : Bringing the Knowledge Perspective into HRM. Human Resource Management, Vol. 48, Nr. 4, 2009, s. 477-483. Teppo, F. and N. J. Foss. 2009. Organizational Routines and Capabilities: Historical Drift and a Course-Correction Toward Microfoundations. Scandinavian Journal of Management, Vol. 25, Nr. 2, 2009, s. 157-167. Knudsen, L. G. 2009. Collaborative R&D Capabilities: In Search of Micro-Foundations. Frederiksberg: Samfundslitteratur, 2009. 253 s. (PhD Series; 23.2009). Abell, P., T. Felin and N. J. Foss. 2008. Building Micro-Foundations for the Routines, Capabilities and Performance links. Managerial and Decision Economics, Vol. 29, Nr. 6, 2008, s. 489-502. Foss N. J., Pedersen T., Pynt J. and Schultz M. Innovating Organization and Management : New Sources of Competitive Advantage. Cambridge : Cambridge University Press, 2012. 249 s.
Felin T., Foss N. J., Heimriks K. H. and Madsen T. Microfoundations of Routines and Capabilities : Individuals, Processes, and Structure. Frederiksberg : Department of Strategic Management and Globalization. Copenhagen Business School, 2012. Moscho, A., L. Bals, S. Neuwirth, and I. Tobies. 2011. Aufbad und Etablierung eines professionellen Inhouse Consulting in einem globalen Konzern. In Inhouse-Consulting in Deutschland : Markt, Strukturen, Strategien. red. A. Moscho and A. Richter. Wiesbaden: GWV Fachverlage GmbH, 2011. s. 31-50. Andersen, T. J. and P. Winther Schrøder. 2010. Strategic Risk Management Practice: How to Deal Effectively with Major Corporate Exposures. Cambridge: Cambridge University Press, 2010. 245 s.
Andersen, T. J. 2010. Combining Central Planning and Decentralization to Enhance Effective Risk Management Outcomes. Risk Management, Vol. 12, Nr. 2, 2010, s. 101-115. Moscho, A., L. Bals, M. Kämper and S. Neuwirth. 2010. Implementing Change Management Successfully - Reinventing an Innovative Corporation: The Bayer Case. In Innovation and International Corporate Growth, red. A. Gerybadze, U. Hommel, H. W. Reiners and D. Thomaschewski. Heidelberg: Springer, 2010. s. 175-190. Andersen, T. J., M. Marcel, G. Collich, K. Focke and J. J. Durante. 2010. Natural Disasters Financial Risk Management : Technical and Policy Underpinnings for the Use of Disaster-Linked Financial Instruments in Latin America and the Caribbean. Washington: Inter-American Development Bank, 2010. 64 s.
Linder, S. and J. Spitzner. 2010. Effektives Risikomanagement in turbulenten Zeiten : Wie Sie Szenarien und Simulationen richtih nutzen. Risk, Compliance & Audit, Vol. 5, 2010, s. 14-19. Andersen, T. J. 2009. Effective Risk Management Outcomes: Exploring Effects of Innovation and Capital Structure. Journal of Strategy and Management, Vol. 2, Nr. 4, 2009, s. 352-379. Andersen, T. J. 2008. The Performance Relationship of Effective Risk Management: Exploring the Firm-Specific Investment Rationale. Long Range Planning, Vol. 41, Nr. 2, 2008, s. 155-176. Andersen, T. J. 2008. Værdien af Risk Management. In Risk Management Håndbogen. Vol. 26.10.2008 Forlaget Andersen, 2008. s. 1-9. Andersen, T. J. 2008. Strategisk risikostyring i en foranderlig verden. København: Atradius, 2008. 9 s.
Foss N. J., and Klein P. Organizing Entrepreneurial Judgment : A New Approach to the Firm. Cambridge : Cambridge University Press, 2012. 299 s.
Foss N. J. Entrepreneurship in the Context of the Resource-Based View of the Firm. Perspectives in Entrepreneurship: A Critical Approach. red. / Kevin Mole, Monder Ram. New York, Palgrave Macmillan, 2012. s. 120-133. Foss, N. J., K. Laursen, T. Pedersen. 2011. Linking Customer Interaction and Innovation : The Mediating Role of New Organizational Practices. Organization Science, Vol. 22, Nr. 4, 01.2011, s. 980-999. Bjørnskov, C. and N. J. Foss. 2010. Economic Freedom and Entrepreneurial Activity: Some Cross-Country Evidence. In Entrepreneurship and Culture, red. A. Freytag and A. R. Thurik. Berlin: Springer, 2010. s. 201-227. Foss, N. J. and P. G. Klein. 2010. Entrepreneurial Alertness and Opportunity Discovery: Origins, Attributes, Critique. In Historical Foundations of Entrepreneurship Research, red. H. Landström and F. Lohrke. Cheltenham: Edward Elgar Publishing, Incorporated, 2010. s. 98-120. Linder, Stefan. 2010. Managerial Innovation: A Glimpse at Individual-level Determinants. In Economic Themes, red. J. Roufagalas. Athen: ATINER, 2010. s. 349-361. Dunlap-Hinkler, D., M. Kotabe and R. Mudambi . 2010. A Story of Breakthrough Versus Incremental Innovation: Corporate Entrepreneurship in the Global Pharmaceutical Industry. Strategic Entrepreneurship Journal, Vol. 4, Nr. 2, 2010, s. 106-127. Foss, N. J. and P. G. Klein. 2010. Alertness, Action, and the Antecedents of Entrepreneurship. Journal of Private Enterprise, Vol. 25, Nr. 2, 2010, s. 145-164. Bjørnskov, C. and N. J. Foss. 2010. Economic freedom and entrepreneurial activity: Some cross-country evidence. In Knowledge, economic organization and property rights: Selected papers, red. N. J. Foss. Cheltenham: Edward Elgar Publishing, Incorporated, 2009. s. 317-338. Foss, K., N. J. Foss, and P. G. Klein. 2010. Original and derived judgment : An entrepreneurial theory of economic organization. In Knowledge, economic organization and property rights : Selected papers, red. N. J. Foss. Cheltenham: Edward Elgar Publishing, Incorporated, 2009. s. 297-316. Foss, N. J. and K. Laursen. 2010. Performance pay, delegation and multitasking under uncertainty and innovativeness: An empirical investigation. In Knowledge, Economic Organization and Property Rights: Selected papers, red. N. J. Foss. Cheltenham: Edward Elgar Publishing, Incorporated, 2009. s. 231-261. Foss, K. and N. J. Foss. 2010. Theoretical isolation in contract theory: Suppressing margins and entrepreneurship. In Knowledge, Economic Organization and Property Rights: Selected papers, red. N. J. Foss. Cheltenham: Edward Elgar Publishing, Incorporated, 2009. s. 109-135. Stieglitz, N. and N. J. Foss. 2009. Opportunities and New Business Models: Transaction Cost and Property Rights Perspectives on Entrepreneurship. Advances in Strategic Management, Vol. 26, 2009, s. 67-96. Bjørnskov, C. and N. J. Foss. 2008. Economic freedom and entrepreneurial activity: Some cross-country evidence. Public Choice, Vol. 134, Nr. 3-4, 2008, s. 307-328. Foss, N. J., P. G. Klein, Y. Y. Kor and J. T. Mahoney. 2008. Entrepreneurship, Subjectivism, and the Resource-Based View: Toward a New Synthesis. Strategic Entrepreneurship Journal, Vol. 2, Nr. 1, 2008, s. 73-94. Foss, N. J. and P. G. Klein. 2008. The Unit of Analysis in Entrepreneurship Research: Opportunities or Investments? International Journal of Entrepreneurship and Innovation, Nr. 6, 2008, s. 145-170. Foss, K. and N. J. Foss. 2008. Understanding Opportunity Discovery and Sustainable Advantage : The Role of Transaction Costs and Property Rights. Strategic Entrepreneurship Journal, Vol. 2, Nr. 3, 2008, s. 191-207. Jensen P. Ø. A Passage to India : A Dual Case Study of Activities, Processes and Resources in Offshore Outsourcing of Advanced Services. Journal of World Business, Vol. 47, Nr. 2, 2012, s. 311-326. Jensen P. Ø. and Pedersen B. Global Sourcing of Services Versus Manufacturing Activities : Is it Any Different?. Service Industries Journal, Vol. 32, Nr. 4, 2012, s. 591-604. Jensen P. Ø. and Pedersen T. Offshoring and International Competitiveness : Antecedents of Offshoring Advanced Tasks. . Academy of Marketing Science. Journal, Vol. 40, Nr. 2, 2012, s. 313-328. Pedersen B. and Hanh P. T. S. Does Export Marketing Engagement by Manufacturers Pay Off? : Evidence from the Vietnamese Wood Furniture Industry. Internationalization of Emerging Economies and Firms. red. / Marin Marinov ; Svetla Marinova. Basingstoke : Palgrave Macmillan, 2012. s. 224-240 (Business & Management Collection 2012). Hobdar B., Sinani E., Papanastassiou M., and Pearce R. The Overseas Expansion of Chinese Multinational Corporations. China and the Multinationals : International Business and the Entry of China into the Global Economy. red. / Robert Pearce. Cheltenham : Edward Elgar Publishing, Incorporated, 2012. s. 187-196. Larsen, M. M. and S. Manning. 2011. The Hidden Costs of Offshoring: The Impact of Complexity, Design Orientation and Experience. Conference paper for Academy of Management Annual Meeting Proceedings. Asmussen, C. G., T. Pedersen, T. M. Devinney and L. Tihanyi. 2011. Introduction to part II: Dynamics of Globalization : Location-Specific Advantages or Liabilities of Foreignness?. In Dynamics of Globalization : Location-Specific Advantages or Liabilities of Foreignness?. red. C. G. Asmussen, T. Pedersen, T. M. Devinney and L. Tihanyi. Vol. 24 1. udg. Bingley : Emerald Group Publishing Limited, 2011. p. 45-85 (Advances in International Management). Ørberg Jensen, P. D. and T. Pedersen. 2011. The Economic Geography of Offshoring: The Fit between Activities and Local Context (Report). Journal of Management Studies, Vol. 48, No. 2, 2011, p. 352-372. Tallman, S. and T. Pedersen. 2011. Global Strategy Journal Second Launch Issue: Comments from the Co-editors. Global Strategy Journal, Vol. 1, No. 3-4, 2011, p. 187-190. Asmussen, C. G. (Editor), T. Pedersen (Editor), T. M. Devinney (Editor) and L. Tihanyi (Editor). 2011. Dynamics of Globalization: Location-Specific Advantages or Liabilities of Foreignness?. Bingley: Emerald Group Publishing Limited, 2011. 462 s. (Advances in International Management). Contractor, F. J., V. Kumar, S. Kundu and T. Pedersen. 2010. Global Outsourcing and Offshoring: In Search of the Optimal Configuration for a Company. In Global outsourcing and offshoring: An Integrated Approach to Theory and Corporate Strategy, red. F. J. Contractor, V. Kumar, S. K. Kundu and T. Pedersen. Cambridge: Cambridge University Press, 2010. s. 3-48. Andersson, U. and T. Pedersen. 2010. Organizational Design Mechanisms for the R&D Function in a World of Offshoring. Scandinavian Journal of Management, Vol. 26, Nr. 4, 2010, s. 431-438. Contractor, F. J., V. Kumar, S. K. Kundu and T. Pedersen. 2010. Reconceptualizing the Firm in a World of Outsourcing and Offshoring: The Organizational and Geographical Relocation of High-Value Company Functions. Journal of Management Studies, Vol. 47, Nr. 8, 12.2010, s. 1417-1433. Contractor, F. J. (Editor), V. Kumar (Editor), S. K. Kundu (Editor) and T. Pedersen (Editor). 2010. Global Outsourcing and Offshoring: An Integrated Approach to Theory and Corporate Strategy. Cambridge: Cambridge University Press, 2010. 464 s.
Ørberg Jensen, P. D. 2009. A Learning Perspective on the Offshoring of Advanced Services. Journal of International Management, Vol. 15, Nr. 2, 2009, s. 181-193. Ørberg Jensen, P. D., J. F. Kirkegaard and N. S. Laugesen. 2009. Beyond job losses: The net effects of offshoring and inshoring on employment in the Danish economy. Strategic Outsourcing: An International Journal, Vol. 2, Nr. 2, 2009, s. 123 - 144. Tate, W. L., L. M. Ellram, L. Bals, and E. Hartmann. 2009. Offshore Outsourcing of Services: An Evolutionary Perspective. International Journal of Production Economics, Vol. 120, Nr. 2, 2009, s. 512-524. Andersen T. J. . Multinational Risk and Performance Outcomes : Effects of Knowledge Intensity and Industry Context. International Business Review, Vol. 21, Nr. 2, 2012, s. 139-152. Rabbiosi L., Stefano E. and Bertoni F. Acquisitions by EMNCs in Developed Markets : An Organisational Learning Perspective . M I R: Management International Review, Vol. 52, Nr. 2, 2012, s. 193-212. Mäkelä K. Andersen U. and Seppälä T. Interpersonal Similarity and Knowledge Sharing within Multinational Organizations . International Business Review, Vol. 21, Nr. 3, 2012, s. 439-51. Asmussen, C. G., T. Pedersen, T. M. Devinney and L. Tihanyi. 2011. Introduction to part II: Dynamics of Globalization : Location-Specific Advantages or Liabilities of Foreignness?. In Dynamics of Globalization : Location-Specific Advantages or Liabilities of Foreignness?. red. C. G. Asmussen, T. Pedersen, T. M. Devinney and L. Tihanyi. Vol. 24 1. udg. Bingley : Emerald Group Publishing Limited, 2011. s. 45-85 (Advances in International Management). Foss, N. J. and J. F. P. Santos. 2011. A Knowledge System Approach to the Multinational Company: Conceptual Grounding and Implications for Research. In Dynamics of Globalization : Location-Specific Advantages or Liabilities of Foreignness?. red. C. G. Asmussen, T. Pedersen, T. M. Devinney and L. Tihanyi. Vol. 24 1. udg. Bingley : Emerald Group Publishing Limited, 2011. s. 425-453 (Advances in International Management). Cassiman, B., M. G. Colombo and L. Rabbiosi. 2011. M & A and Innovation : The Role of Relatedness between Target and Acquirer. Managing Innovation Driven Companies: Approaches in Practice. red. / H. Tschirky, C. Herstatt, D. Probert, H. Gemuenden, M. G. Colombo, T. Durand, P. C. De Weerd-Nederhof and T. Schweisfurth. Houndmills: Palgrave Macmillan, 2011. s. 56-67. Nell, P. C., A. Björn and B. B. Schlegelmilch. 2011. The Benefits of Hierarchy? : Exploring the Effects of Regional Headquarters in Multinational Corporations. In Dynamics of Globalization: Location-Specific Advantages or Liabilities of Foreignness? red. C. G. Asmussen, T. Pedersen, T. M. Devinney and L. Tihanyi. Vol. 24 Binglev: Emerald Group Publishing Limited, 2011. s. 85-106 (Advances in International Management). Pedersen, T., C. Soo and T. M. Devinney. 2011. The Importance of Internal and External Knowledge Sourcing and Firm Performance: A Latent Class Estimation. In Dynamics of Globalization: Location-Specific Advantages or Liabilities of Foreignness? red. C. G. Asmussen, T. Pedersen, T. M. Devinney and L. Tihanyi. Vol. 24 Binglev: Emerald Group Publishing Limited, 2011. s. 389-423 (Advances in International Management). Andersen, T. J. 2011. The Risk Implications of Multinational Enterprise. In International Journal of Organizational Analysis, Vol. 19, Nr. 1, 2011, s. 49-70. Hansen, M. W., B. Petersen and P. Wad. Change of Subsidiary Mandates in Emerging Markets: The Case of Danish MNCs in India. Transnational Corporations Review, Vol. 3, Nr. 2, 2011, s. 104-116. Nell, P. C., B. Ambos and B. B. Schlegelmilch. The MNC as an Externally Embedded Organization: An Investigation of Embeddedness Overlap in Local Subsidiary Networks. Journal of World Business, Vol. 46, Nr. 4, 2011, s. 497-505. Hotho, J. J. 2011. Managing the Contemporary Multinational: The Role of Headquarters. Journal of International Management, Vol. 17, No. 3, 2011, s. 260-262. Andersson, U. and U. Holm. 2010. Introduction and Overview. In Managing the Contemporary Multinational: The Role of Headquarters, red. U. Holm and U. Andersson. Cheltenham: Edward Elgar Publishing, Incorporated, 2010. s. 1-29 (New Horizons in International Business ). Andersson, U. and P. Kappen. 2010. Headquarters Potential Value-Adding by Cherry-Picking Sub-Unit Technology Development Projects. In Managing the Contemporary Multinational : The Role of Headquarters, red. U. Andersson and U. Holm. Northampton, MA: Edward Elgar Publishing, Incorporated, 2010. s. 160-181 (New Horizons in International Business). Benito, G. R. G., J. Larimo, R. Narula and T. Pedersen. 2010 Multinational Enterprises from Small Economies: The Internationalization Patterns of Large Companies from Denmark, Finland and Norway. In Handbook on Small Nations in the Global Economy: The Contribution of Multinational Enterprises to National Economic Success, red. D. Van Den Bulcke, A. Verbeke and W. Yuan. Cheltenham: Edward Elgar Publishing, Incorporated, 2010. s. 135-153. Gammelgaard, J. and T. Pedersen. 2010. Internal versus External Knowledge Sourcing of Subsidiaries and the Impact of Headquarters Control. In Managing the Contemporary Multinational: The Role of Headquarters, red. U. Andersson and U. Holm. Cheltenham: Edward Elgar Publishing, Incorporated, 2010. s. 211-230. Nell, P. C., U. Andersson and B. B. Schlegelmilch. 2010. Subsidiary Contribution to Firm-Level Competitive Advantage: Disentangling the Effects of MNC External Embeddedness. In Reshaping the Boundaries of the Firm in an Era of Global Interdependence, red. J. P. Barber and J. Alegré. London: Emerald Group Publishing Limited, 2010. s. 173-195. Ambos, T., U. Andersson and J. Birkinshaw. 2010. What are the Consequences of Initiative-Taking in Multinational Subsidiaries. Journal of International Business Studies, Vol. 41, Nr. 7, 2010, s. 1099-1118. Becker-Ritterspach, F., A. Saka-Helmhout and J. J. Hotho. 2010. Learning in Multinational Enterprises as the Social Embedded Translation of Practices. Critical Perspectives on International Business, Vol. 6, Nr. 1, 2010, s. 8-37. Hashai, N., C. G. Asmussen, G. R. G. Benito and B. Petersen. 2010. Technological Knowledge Intensity and Entry Mode Diversity. M I R: Management International Review, Vol. 50, Nr. 6, 2010, s. 659-681. Yamin, M. and U. Andersson. 2010. Subsidiary Importance in the MNC: What Role Does Internal Embeddedness Play?. International Business Review, Vol. 19, Nr. 6, 2010. Nielsen, B. B. and S. Nielsen. 2010. A Multilevel Approach to Understanding the Multinationality: Performance Relationship. In The Past, Present and Future of International Business & Management, red. T. Devinney, T. Nielsen and L. Tihanyi. Bingley: Emerald Group Publishing Limited, 2010. s. 527-557. Foss, N. J. and T. Pedersen. 2010. Transferring knowledge in MNCs : The role of sources of subsidiary knowledge and organizational context. In Knowledge, Economic Organization and Property Rights: Selected papers, red. N. J. Foss. Cheltenham: Edward Elgar Publishing, Incorporated, 2009. s. 61-79. Hansen, M. W., M. M. Larsen, T. Pedersen, B. Petersen and P. Wad. 2010. Strategies in Emerging Markets: A Case Book on Danish Multinational Corporations in China and India. Frederiksberg: Copenhagen Business School Press, 2010. 185 s.
Andersson, U. (Editor), U. Holm (Editor) and P. Kappen (Editor). 2010. Managing the Contemporary Multinational: The Role of Headquarters. Cheltenham: Edward Elgar Publishing, Incorporated, 2010. 319 s. (New Horizons in International Business). 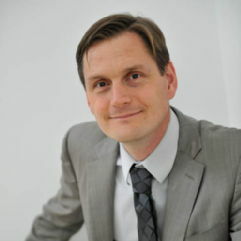 SMG's Associate Professor Wolfgang Sofka. What made you interested in working at SMG? I have known people of SMG through seminars, conferences and obviously their research for a long time. It was easy to tell from the outside that it is an ambitious place that wants to be competitive at the highest international levels. While there are many ambitious places, I always liked the explicit philosophy of working together as a team in the department. The latter gave SMG its unique touch, in my eyes. The primary topic of my research is how firms turn knowledge into superior firm performance. This has a lot of different angles and unintended consequences originating from the nature of knowledge. Overprotective firms may, for example, scare away potential partners but naive firms may not survive long enough in competition to harvest the fruits of their R&D investments. My current research focuses on how these challenges can be managed at the firm level, e.g. how and where firms should search for external knowledge, when should they use markets for technology and when do they need to balance knowledge search with knowledge protection. What do you consider your contribution to the field? My research setting is basically defined by the nature of knowledge and how it can be exchanged. What makes it interesting to me is that it is a bit “messy” to manage for firms: Performance potentials are always large but things can easily go wrong and well-intended initiatives can have severe, unintended consequences. I hope my research helps to bring some order to this field in the sense that better and more comprehensive theory allows more accurate predictions for further academic theory and hopefully practice. How do you see the future of your research? Knowledge production and knowledge exchanges are governed at various levels, e.g. through individual scientists and engineers, teams and firm hierarchies as wells as national institutions. I am intrigued by how these levels interact with one another. What can this look like in less abstract terms? Currently I am looking at what happens with the knowledge that a Multinational Company has transferred across national borders once the foreign subsidiary is closed down and the consequences of this closure for host country employees, firms and whole regions. There are various reasons why I have come to SMG. First, I think that I was about to be thrown out of the UK due to my lack of respect for authority and Denmark seems a safer place for someone like me. On a more serious note, I think SMG offers me an environment where I can get more out of myself. People here are productive as researchers and in other ways and there is both a strong sense of community and some friendly competition. That was unfortunately missing in my previous workplace. I like to think of my overall interests as broadly being in management to avoid seeing any one topic in isolation. Specifically I continue to explore outsourcing and offshoring issues, and am always looking for new angles to those issues. Perhaps another empirical context, perhaps a novel theoretical angle or method. In recent years I have been involved in more case study work for instance. I have also tried to apply behavioral and institutional theories to these topics. Currently we are finalizing coding work on an outsourcing meta-analyis project, so hopefully that will also generate some novel insights, particularly of a cross-national nature. On top of that I continue to look at innovation as well, including management innovation. There is a lot of potential for publications in that area, but I would like it to be exciting projects with potentially big impact. If you think about it as a business portfolio it is ideal to have one area with a steady stream of output and one with the occasional big hit. Bluntly speaking I tend to believe that any of us could drop dead tomorrow and it would not fundamentally impact on the field - we are all little fish in a huge pond and in management even seemingly fundamental contributions are really mostly incremental ones full of common sense. So I rephrase the question as 'what do you like about what you have published in the field'? I am happy to have given one really big push, consisting of one paper and a few others, to the management innovation field and a variety of smaller pushes to work on sourcing strategy. I am not really the kind of person to plan ahead too far. But I hope to enjoy myself by exploring new ideas and gathering more empirical evidence and also want to pick up the pace of publications whilst here. I also hope to publish with students more, so far that has not really worked out well for a variety of reasons.